alleged plans by the All Progressives Congress (APC) to implicate some of its members ahead of President Muhammadu Buhari's visit to Ilorin on Monday. The State publicity secretary of the party, Tunde Ashaolu raised the alarm in a statement made available to newsmen in Ilorin on Saturday. He said the party has uncovered plot by the APC stalwarts to distribute PDP vest they have printed to some hoodlums hired to unleash terror on innocent residents. He said this is being planned to create the erroneous impression that the perpetrators of the planned attack on residents are PDP members. He recalled that the party had at a press briefing about a fortnight ago alerted the public to plots by APC leadership in the state to get some PDP members arrested on trump up charges. Ashaolu added: During the press conference address by our party's state chairman we listed seven top members of our party who have been slated for arrest on trumped up charges in order to intimidate the party." He asked Nigerians to prevail on the security operatives not to be used for political vendata, pointing out that his party has been engaged in campaigns for long now without any untoward incident. Ashaolu statement partly reads: "As you are all aware, the President Muhammadu Buhari is billed to visit Kwara state on Monday in furtherance of his campaign tour of the country. 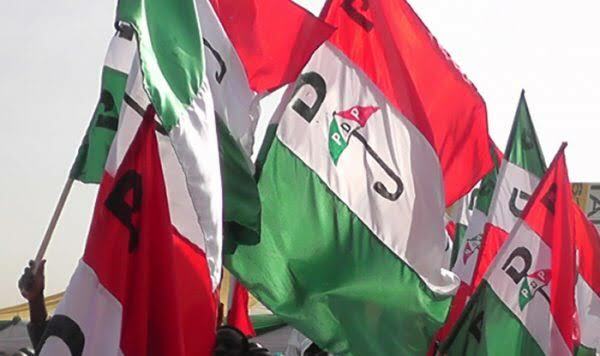 "However, we want to draw the attention of the public to plot by members of the opposition All Progressives Congress(APC) in the state to rope and get prominent members of our party arrested on trump up charges before the date of Mr President's visit to the state. "Information at our disposal indicates that APC stalwarts have concluded plans to distribute vests with PDP inscriptions to some thugs hired to unleash terror on innocent residents. "Top on the list of our party's leaders pencilled down for illegal arrest are the north and central senatorial chairmen of the PDP, Alhji Isiaka Oniwa and Alhaji Jimoh Adesina respectively. Others include the Director General of the Mandate ABS Constituency Office, Ilorin, Alhaji Musa Abdullahi,Mr Taju Alabi, Alhaji Oba Ajara, Alhaji Alfa Dembo, Barr. Lanre Daibu, Hon. Isiaka Magaji, Alhaja Sarat Adebayo, among others. "We want the whole World to know that none of our members slated for arrest prior to Mr President's visit has committed any offence known to the law which could precipitate their arrest. Leaders and members of our party are peace loving and law abiding citizens who can not hurt a fly let a whole President of the country. "Our party is also peaceful unlike the factionalised state APC. If there is anyone that will want to foment trouble during the President's impending visit, such persons should be searched for within the fold of the factionalised and troubled APC.